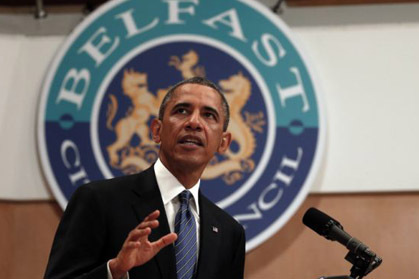 Don’t look now but President Obama’s trip to Northern Ireland is coming at a critical time. Contrary to some opinion it is a vital visit. His speech at Waterfront Hall was less significant for what he said rather than the fact that he made it. When the President of the United States pays attention to an issue then everyone else does too. It is American soft power at its best and it has always worked in Northern Ireland. It was no coincidence that British leader David Cameron met Northern Ireland’s two leaders, Peter Robinson and Martin McGuinness, last week and announced a major economic package. In addition, he announced an investment conference for October aimed at bringing new industry to Northern Ireland. The announcement came after strong pleading from the North that the gains of the peace process were endangered if there was not a significant increase in economic activity leading to jobs and opportunity. It is doubtful that the new initiatives would have happened if the United States president was not on his way. Northern Ireland has languished out of the headlines and a gradual erosion of the peace process has taken place. Most serious was the issue of securocrats attempting to undermine the peace agenda. Last month Irishman John Downey was arrested in Gatwick Airport and charged with the Hyde Park bombings and death of four soldiers in 1982. Deeply significant was the fact that Downey had been assured in a letter that following the peace process, he was free to come and go in the general amnesty that prevailed. There are many horrific and unsolved murders from all sides during The Troubles. Clearly there are groups within the British establishment, given the Boston College subpoenas and now John Downey who want to start the war all over again. That is why the visit of President Obama is so vital. Coverage of Northern Ireland exposes these latest negative developments and also forces politicians there on all sides to make greater efforts to reach agreement on issues. It was thus during President Clinton’s time when many major developments occurred in the arc of a visit by the U.S. president. George Bush, in fairness, also helped achieve breakthroughs. Now it is Obama’s turn and his visit is a critical moment in cementing a peace that has looked even more uneasy in recent times.